Let’s talk about power cues. Things like this: when feeling unconfident, duck into the bathroom or an empty meeting room and adopt a super woman pose (hands on hips, feet wide apart) for ten minutes. Do this and you’ll start to automatically feel more confident. Sounds a little nutz, but if you don’t believe me then watch this Ted video by Amy Cuddy. 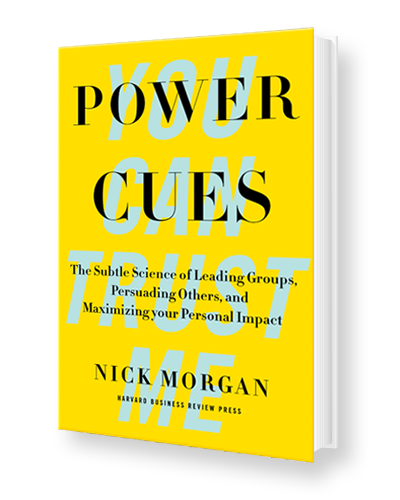 I digress – back to this book on seven power cues. Adopt them and (according to the author) become a become the type of leader that walks into a room and charms the pants off everyone. To avoid any suspense – here’s the seven cues: self awareness, non-verbal communication, unconcious messages, your voice, signals you send, intiutition (unconcious mind) and telling stories. I think the key phase in that last tip is be subtle about it! I’m sure your boss would find it a little strange if you started copying their every move. Want to delve into the tips? Grab the book here.